Published in Boston by Oliver Ditson & Co.
"If you feel the song yourself, you can carry the audience with you." By 1863 the public taste for Civil War music was changing. Songs such as The Battle Cry of Freedom and The Flag of Our Union Forever were giving way to haunting music conceived in sorrow. These songs narrated the grief of wives, sweethearts and mothers. Some examples included The Girl I Left Behind Me and Just Before the Battle Mother. 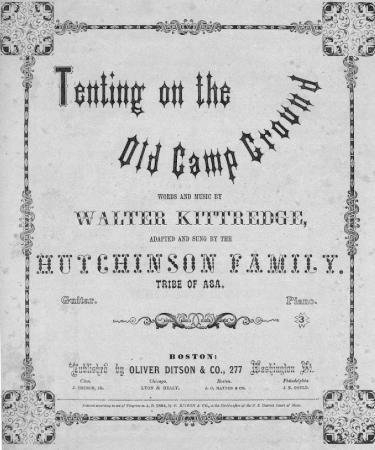 Perhaps the greatest of this type of Civil War song is Tenting Tonight on the Old Camp Ground by Walter Kittredge. He was born in Merrimac near Reed's Ferry, New Hampshire on October 8, 1834. When he was twelve, he cut himself a hollow onion stalk, nicked out stops and managed to coax a tune from it. Kittredge was a young New Hampshire musician who had published the Union Songbook in 1861. Tenting Tonight on the Old Camp Ground is one of the best remembered of all Civil War songs. The song's simple words and nostalgic imagery continues to move audiences today. Walter Kittredge was a born minstrel of the people and nicknamed the "Minstrel of the Merrimac." He knew the challenges of everyday life and deeply felt the sorrows, emotions and events of the period. He translated these experiences in his music. During the fall of 1857 he traveled throughout the Northeast and along the Connecticut River with Joshua Hutchinson of the famous Hutchinson Family Singers. There was a twenty-three year age difference between Hutchinson and the younger Kittredge. It was Joshua who taught the young minstrel to sing and play. As time and events leading up to the Civil war proceeded, Kittredge's singing tour events multipled do to the singer's ability to reflect the spirit of the times in his music. During the exciting Lincoln and Douglas debates the singer and songwriter sang songs like Red, White & Blue at open-air gatherings selling his compositions to support himself. The Civil War was in full development by 1863 when he received notice that he had been drafted to serve in the army and must report at once to Concord, New Hampshire. The night before he left, he sat beside the window looking out across the twilit New Hampshire fields. He reached for his violin and inspired by sadness, regret and thoughts of soldier life that were all too familiar, with all their mingled glory and pathos, a song began to take form. His thoughts continued to wander away into the South and to the camps where soldiers were gathered. "Many are the hearts," he thought, "many are the hearts that are weary tonight, wishing for the war to cease." The music and words of Tenting Tonight on the Old Camp Ground came together that night. Not a word or a note was ever changed later. Kittredge took his song to the Oliver Ditson Company a Boston publisher and offered to sell it for fifteen dollars. He was told it was too sad and sentimental and that there was nothing to it. Asa Hutchinson a friend and musical partner knew the song would be a success. Asa and Walter had sung and toured together a number of times before. Asa promised to interest the company, which published Hutchinson songs, and the two men agreed to divide the royalties equally. The Oliver Ditson Company paid two and a half cents on each copy sold and agreed to supply Kittredge and the Hutchinsons with copies to be sold at concerts for eight cents apiece. Within two years both men would realize a thousand dollars apiece in royalties from Tenting Tonight on the Old Camp Ground. 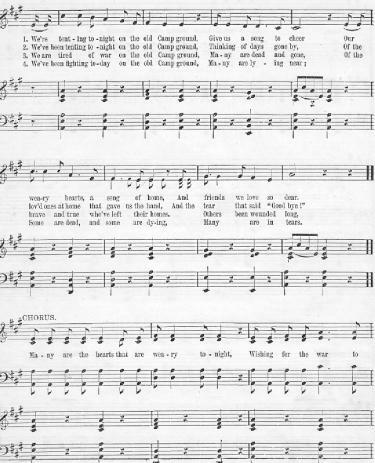 The song's halting verse and melancholy refrain was performed publicly by the Hutchinson Family Singers for the first time in 1863 at Old High Rock in Lynn, Massachusetts. The concert audience paid eight cents a ticket to attend the open-air performance. With the smoky flare of lamps, the stars overhead, and the silent people, many of whom had sons at the battlefront, sitting close together on the cold rock, the song had a perfect setting. 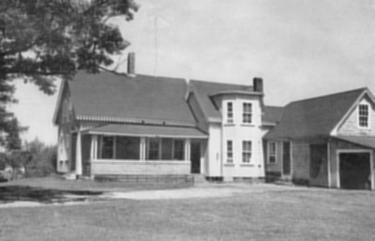 Within six months after the song's premier over ten thousand copies of the Tenting Tonight on the Old Camp Ground had been sold. The song's popularity did not stop after the war. In 1866 they sang it everyday during a weeklong anti-slavery convention. It also maintained a place of honor on the musical program at both the Philadelphia Centennial of 1876 and the Great Soldiers' Reunion in Washington in 1892. 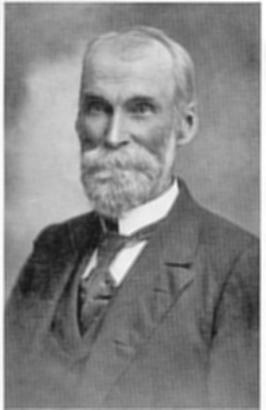 Walter Kittredge died at Merrimac, New Hampshire on July 8, 1905. The home of Walter Kittredge in Reed's Ferry, New Hampshire, where he spent most of his adult life and where he wrote Tenting Tonight on the Old Camp Ground the song that made him famous.